Every iOS update comes with a few glitches. Though, a lot of users are complaining about the photos disappeared after iOS 12/12.2 update issue. As I did an extensive research, I realized that the problem is more common than you might think. After the iOS 12/12.2 update, there could be a problem with the iCloud sync or the photos could actually be deleted from your device. To help you fix the iPhone photos disappeared from camera roll after iOS 12/12.2 update issue – I have listed some expert solutions. Let’s discuss them in detail right away. Part 6: Is there any tool to recover photos directly from iPhone on iOS 12/12.2? Sometimes the simplest solution can fix the most complicated of issues in an iPhone. If you have found your photos missing after iOS 12/12.2 update, then consider restarting your device. If there is a minor issue with your iPhone, then most likely it will be fixed with a simple restart. Press the Power (wake/sleep) button on your phone. For newer devices, it is located on the right side while for previous models it is on the top of the phone. Drag the power slider to confirm. Wait for a while as the device would be turned off. After a few seconds, hold the Power button again to restart your device. Release it once you see the Apple logo. At the same time, press and hold the Side button and either of the Volume up/down buttons. Release them once the Power slider would appear on the screen. Drag it to confirm your choice. Once the phone is turned off, long press the Side button for a while. Let it go once you see the Apple logo on the screen. In this way, you can simply restart your iPhone and check if the missing photos would appear or not. Alternatively, if your device runs on iOS 11 or iOS 12, then you can just go to its Settings > General> Shut Down to turn off your phone as well. If there is an issue with the iCloud sync on your device, then it can also make you feel as if your photos disappeared after iOS 12/12.2 update. To check this, go to your phone’s photos app and view the available content. If you can find the local photos, but not the ones that were synced with your iCloud account, then there could be a problem with its syncing process. As you know, the iCloud Photo Library feature makes the iCloud sync happen across different devices. If you want to retain the photos disappeared from iPhone after update, then just reset this option. Go to your phone’s Settings > iCloud > Photos and turn off “iCloud Photo Library”. After that, wait for a while, and turn it back again. 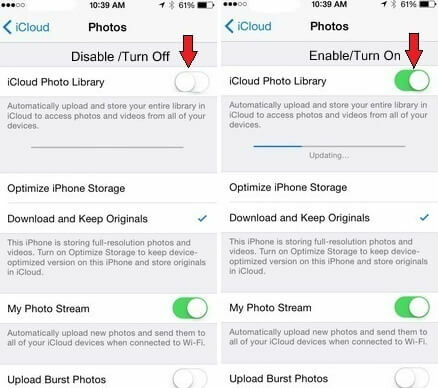 If you are trying to access the synced iCloud photos via cellular data, then you should check these settings. 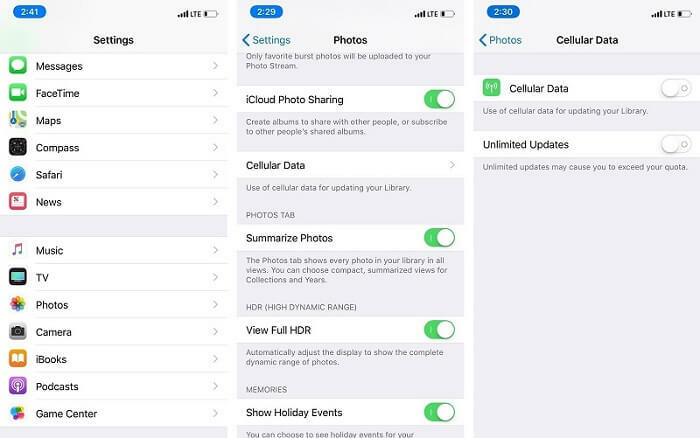 Go to iCloud Photo settings and tap on “Cellular Data”. From here, you need to make sure the cellular data option is enabled. Otherwise, the syncing will only take place when your phone is connected to a Wifi network. Chances are that there could be a lack of free space on your iCloud account as well. 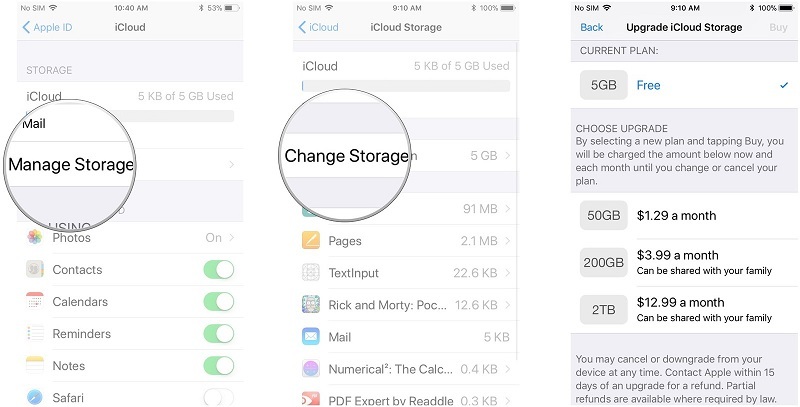 To check this, go to your phone’s iCloud Store and tap on “Manage Storage”. From here, you can check how much free space is left. If you want, you can buy extra storage from here as well. If nothing else would seem to work, then consider resetting your Apple account. Simply go to your phone’s settings, tap on your Apple account, and sign out from it. Afterward, sign-in to it again with your account credentials. Besides that, there are several other solutions to fix iCloud photos not syncing problem as well that you can further explore. The “Recently Deleted” folder was first introduced in the iOS 8 update way back in 2014 and later got an upgrade with iOS 11. 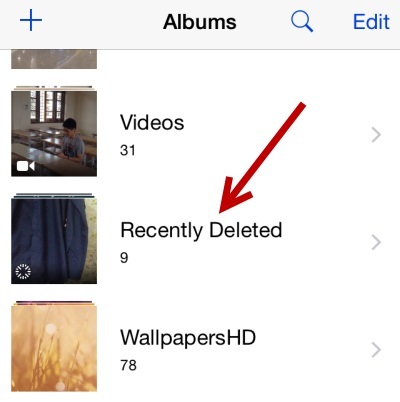 It is a dedicated folder in iPhone that temporarily keeps the photos you have deleted in the last 30 days. Therefore, if you have accidentally deleted your photos, then you can simply recover them by visiting the “Recently Deleted” folder. The same approach can be implemented to retrieve iPhone photos that were disappeared from Camera Roll after iOS 12/12.2 update. Unlock your device and go to its Albums. From here, you can view a “Recently Deleted” folder. Just tap on it. Here, you can view all the photos that were deleted in the last 30 days. Tap on the Select button to pick the photos you wish to recover. Once you have made the selections, you will get an option to either delete these photos permanently or recover them back to your phone. Tap on the “Recover” option. You will be asked to confirm your choice. Simply tap on the Recover button, which will also list the number of photos that would be restored. That’s it! After that, all the selected photos will be recovered back to their original source. Though, you should be a bit cautious and follow this approach early as the Recently Deleted folder can only store photos that have been deleted in the last 30 days. Once that duration is crossed, the photos will be deleted permanently from your device. If you have already taken a backup of your photos with iTunes, then you can use it to restore the deleted or lost content as well. The only problem is that when we use iTunes to restore a backup, it deletes all the existing data on our phone. To resolve this problem and restore your deleted photos, you can use a third-party tool like dr.fone - Recover (iOS). Retrieve data directly from iPhone, iTunes backup and iCloud backup. Download and extract iCloud backup and iTunes backup to retrieve data from it. 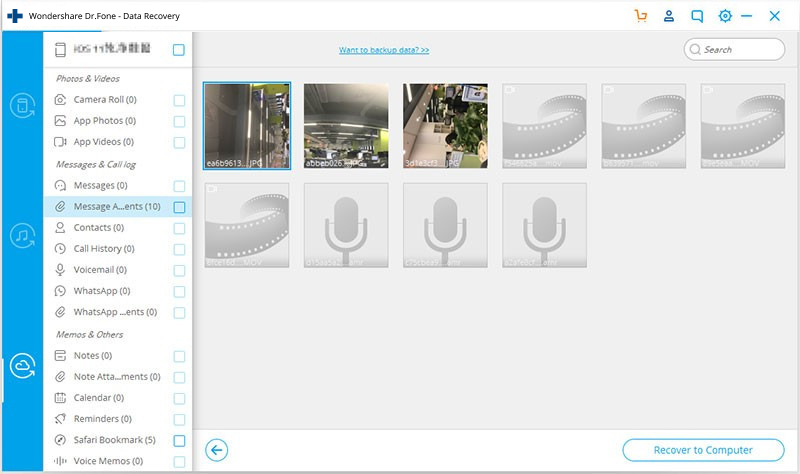 Preview and selectively recover data in original quality. 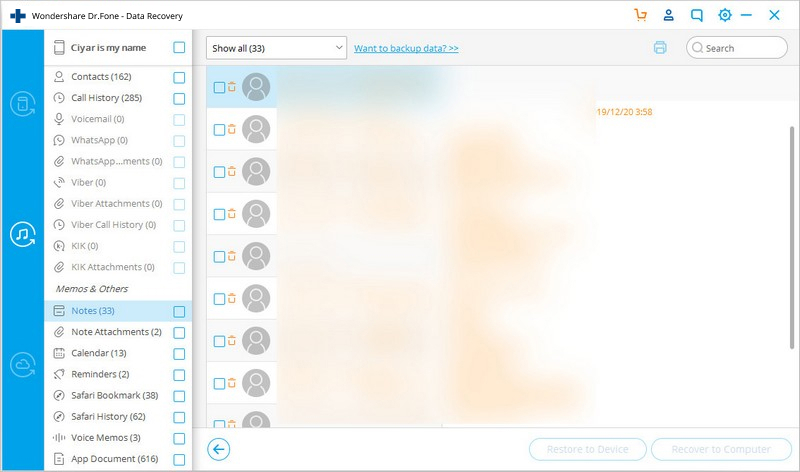 Developed by Wondershare, it is a complete data recovery tool that can help you retrieve your data under different scenarios. In this case, we will use dr.fone – Recover (iOS) to restore photos from a previous iTunes backup without deleting the existing content on our device. If your photos are missing after iOS 12/12.2 update and you have a previous iTunes backup available, then this would be a perfect solution for you. 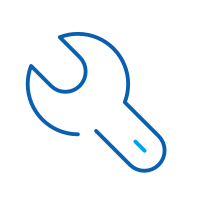 Launch the dr.fone toolkit on your Mac or Windows PC and go to the “Recover” module from its home. Connect your device to the system and let it be detected by the application automatically. Now, choose to recover iOS data to proceed. From the left panel, click on the “Recover from iTunes Backup File”. The tool will automatically detect all the existing iTunes backup files and provide their basic details. Simply select a file and start scanning it. Wait for a while as the application would automatically retrieve the data from the file. All the retrieved data will be segregated into different categories. Just go to the Photos tab and preview the pictures. Select the photos you wish to get back and restore them to your computer or directly to your iPhone. 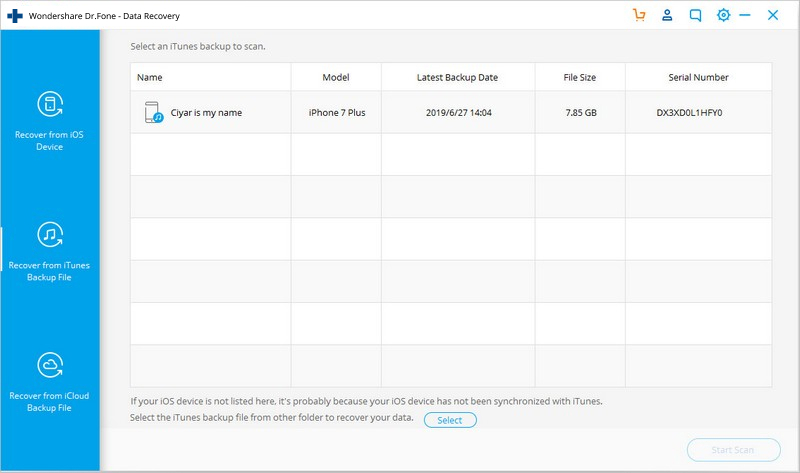 Just like iTunes, dr.fone – Recover (iOS) can also be used to recover photos from an iCloud backup as well. If you won’t use dr.fone – Recover (iOS) then you first need to reset your device entirely. This is because the option to restore iCloud backup is given while setting up a new device. The good thing is that dr.fone - Recover (iOS) can help you selectively restore photos from an iCloud backup without the need to reset your device. In this way, you won’t have to get rid of your existing data while restoring the iCloud backup. All of this makes it a perfect solution to restore the photos disappeared after iOS 12/12.2 update. 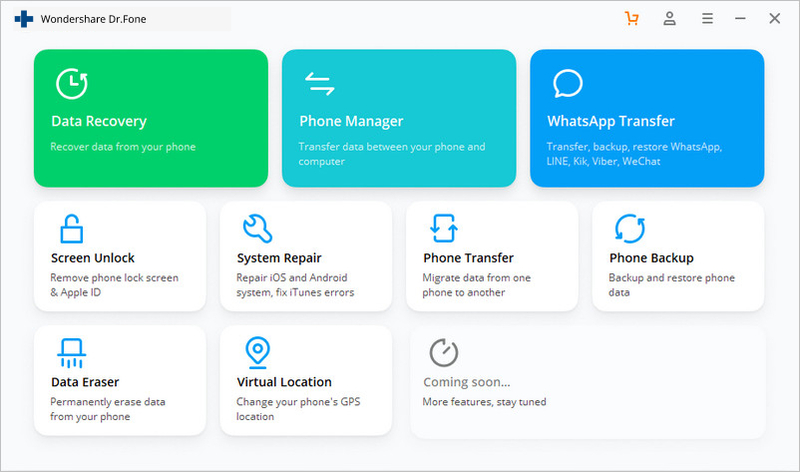 Launch dr.fone – Recover (iOS) on your system and connect your phone to it. To start with, choose to recover data from an iOS device. Great! Now from the left panel, click on the “Recover from iCloud Backup file” option. 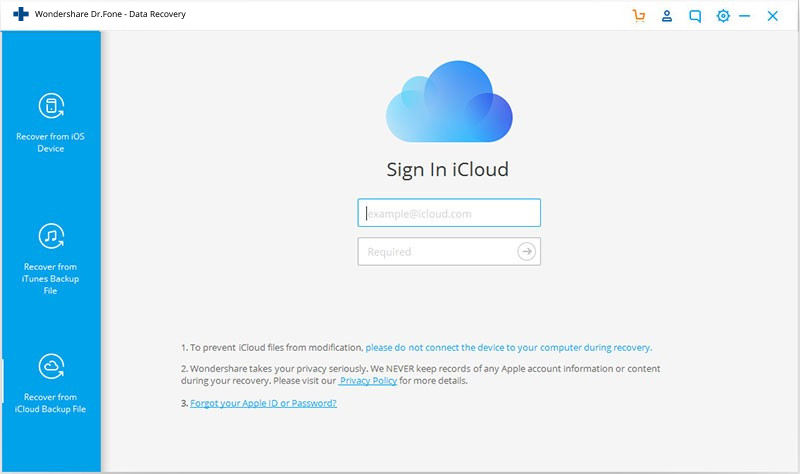 You would have to log-in to your iCloud account on the native interface by providing the right credentials. 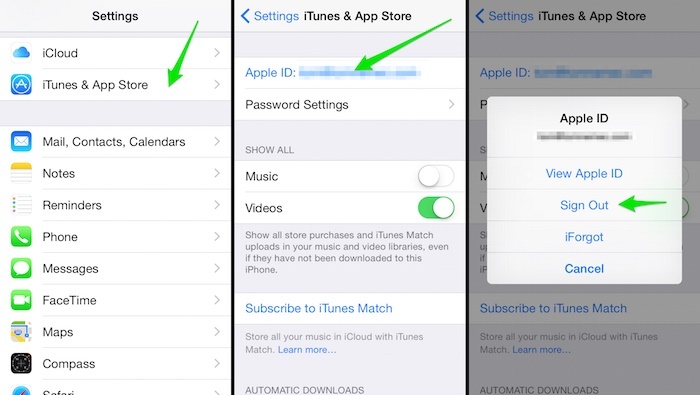 Once you have logged-in to your iCloud account, the application will automatically display all the previous iCloud backup files associated with your account. Simply select the file of your choice and click on the “Download” button. 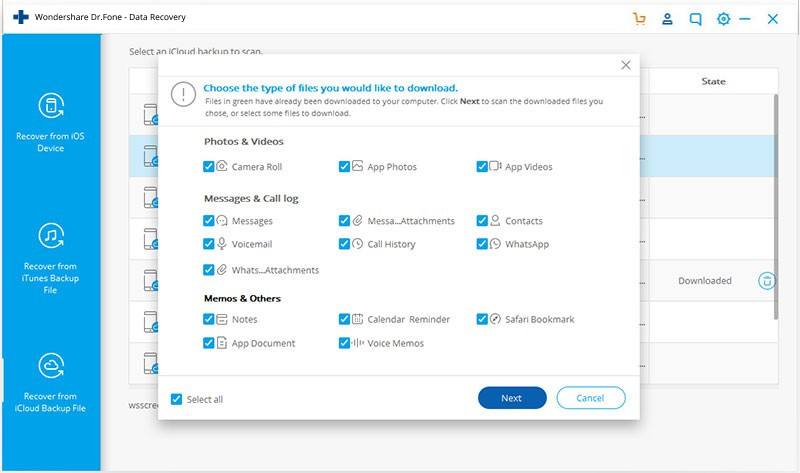 The following pop-up would appear and ask you to select the type of data you wish to download. Make sure the “Photos & Videos” options are enabled before you click the “Next” button. Sit back and wait for a while as the application will download the data and display it under different categories. From the left panel, go to the Photos option and preview the pictures you wish to retrieve. Select them and click on the Recover button to get them back. Besides photos, you can also recover videos, contacts, messages, music, and tons of other data types using dr.fone – Recover (iOS) as well. It is an extremely user-friendly and sophisticated tool, which will let you selectively recover data from iTunes and iCloud backup. You might have seen a few data recovery tools on the web, claiming to perform a direct data recovery on iOS 12/12.2. 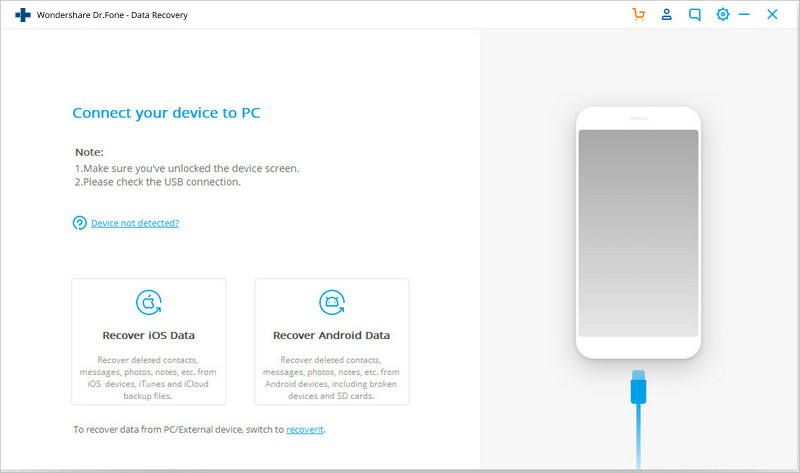 The truth is that as of now, there is no data recovery tool that can recover data from any device running on iOS 12 directly. 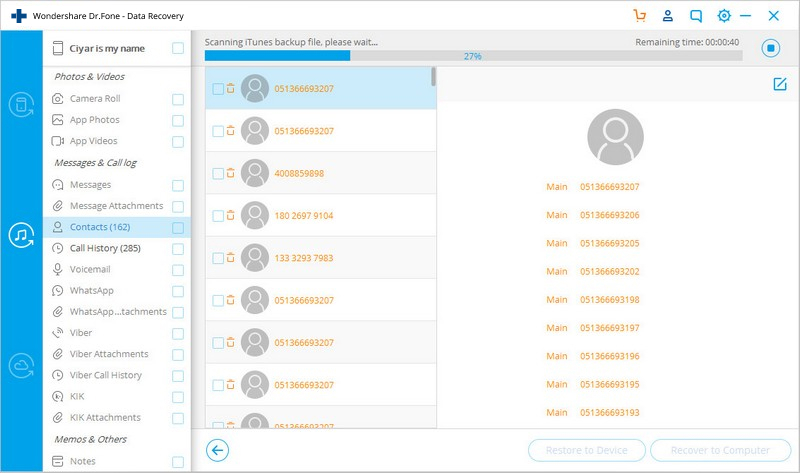 Just like dr.fone – Recover (iOS), they can only retrieve your data from a previous backup. I would recommend you not to fall for their false claims and only go with a reputed tool (like dr.fone – Recover (iOS)) that provides 100% transparent results. That’s it folks! Now when you know all the common ways to recover photos disappeared from iPhone after update, you can easily overcome this issue. I followed the same drill after iOS 12 deleted my photos and got my lost content back as well. Go ahead and give these suggestions a try. 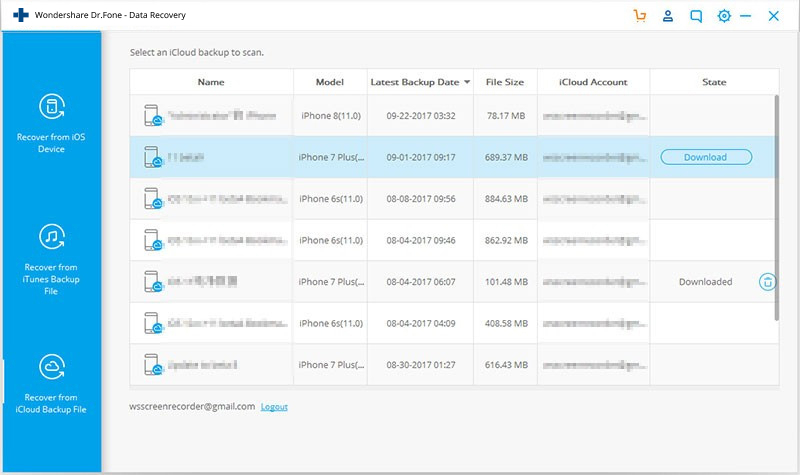 In order to recover your data from an existing iCloud or iTunes backup, simply take the assistance of dr.fone - Recover (iOS). It is a highly reliable tool that will come handy to you on numerous occasions. Have upgraded to iOS 12 Beta by curiosity and now want to downgrade to iOS 11.4? Check out how to downgrade from iOS 12 to iOS 11 with or without iTunes step by step.